Unique and authentic, the Provence 12 is a hallmark Helen Kaminski classic. Hand crocheted from 100% Madagascan raffia you can expect slight variations and a unique addition to your collection. 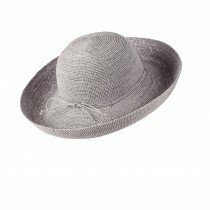 Featuring a wide 12cm brim, hand rolled raffia tie for adjustable sizing and comfortable neoprene inner band, this style rolls and packs for the perfect year round travel companion.